Larva of Dermatobia hominis, the cause of furuncular cutaneous myiasis in man, cattle, dogs, other mammals and some birds in Central and South America. D. hominis is occasionally seen in international travellers from outside the region. Dermatobia belongs to the Cuterebrinae sub-family of the Oestridae family of Diptera. 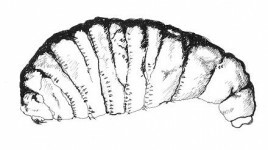 Their larvae have bodies with strong, evenly distributed spines and posterior spiracles with a lot of small, serpentine slits. 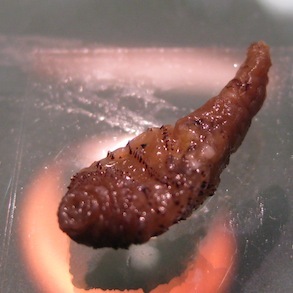 A small nodule with a central breathing pore develops around the larva at the site of penetration. These swelling usually last for a few weeks, before the mature larva emerges and drops to the ground to pupate. Hall MJR, Smith KGV. Diptera causing myiasis in man. Ch 12. ed Lane RP, Crosskey RW. Medical Insects & Arachnids. Chapman & Hall, London, 1993. ISBN 0 412 40000 6.